Incidents of piracy and armed robbery of ships in the first quarter of this year are down when compared to the same period last year. That’s the word from the International Chamber of Commerce International Maritime Bureau (IMB) when it released the latest statistics in London this week. In the first three months of 2019 IMB reported 38 incidents of piracy and armed robbery at sea – 28 less than the first quarter of 2018 (66). IMB’s Piracy Reporting Centre detailed 27 vessels were boarded, seven vessels were fired on and four attempted attacks occurred. No vessels were reported hijacked for the first time since the first quarter of 1994. “The latest statistics from the IMB Piracy Reporting Centre are encouraging, said IMB director Pottengal Mukundan adding first quarter statistics was too short a period to anticipate trends for the year. “It confirms the importance of information sharing and co-ordinated action between industry and response agencies. Going forward, it is critical to build more effective reporting structures to enable a strong, unified response when dealing with piracy incidents,” he said. The Gulf of Guinea represented a high number of piracy and armed robbery attacks at sea, with 22 incidents reported. The region also accounted for all worldwide crew kidnappings as 21 crew members were kidnapped across five separate incidents. Incidents were reported in the coastal countries of Benin, Cameroon, Ghana, Ivory Coast, Liberia, Nigeria and Togo. Nigeria has been a hotspot for piracy incidents over the past decade but the first quarter of 2019 saw a decrease in reported piracy incidents. Nigeria reported 14 incidents of piracy for quarter one 2019 compared to 22 in 2018. This confirms the Nigerian Navy’s increased efforts to “actively respond to reported incidents by dispatching patrol boats”. Nigerian waters remain risky, especially the port of Lagos where four incidents were reported. In Asia, Indonesia also saw a decrease in piracy activities for the first quarter of 2019. Three incidents were reported against anchored vessels in ports in Indonesia – the fewest reported since 2010 – according to the report. 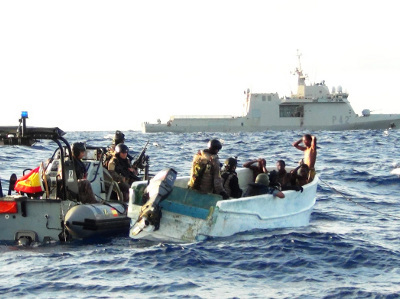 As with Nigeria, increased co-operation and information sharing between the Indonesian Marine Police and IMB Piracy Reporting Centre enabled regular patrols in high-risk areas.